2. He has accepted campaign money from Defense contractor Raytheon, a defense contractor, he continues his undying support of the $1.5 trillion F-35 industry and said that predator drones "have done some very good things". Sanders has always voted in favor of awarding more corporate welfare for the military industrial complex - and even if he says he's against a particular war he ends up voting in favor of funding it. 3. He routinely backs appropriations for imperial wars, the corporate scam of Obamacare, wholesale surveillance and bloated defense budgets. He loves to bluster about corporate welfare and big banks but he voted for funding the Commodity Futures “Modernization” Act which deregulated commercial banks and created an “unregulated market in derivatives and swaps” which was the major contributor to the 2007 economic crisis. 4. 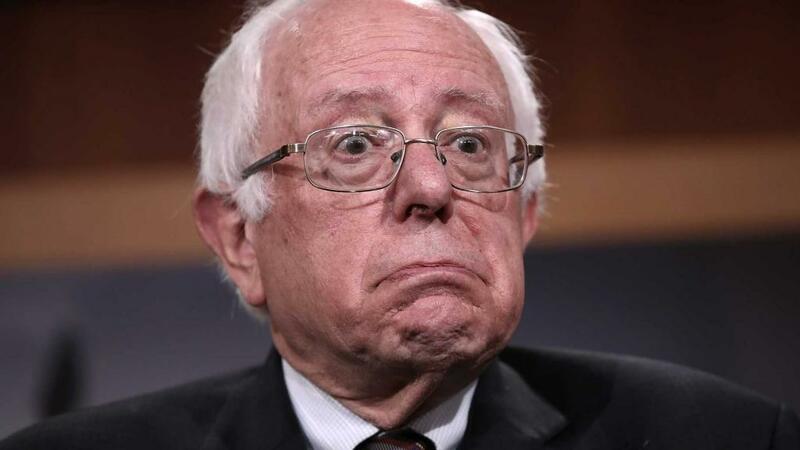 Regardless of calling himself an "independent", Sanders is a member of the Democratic caucus and votes 98% of the time with the Democrats and votes in the exact same way as war criminal Hillary Clinton 93% of the time. Sanders campaigned for Bill Clinton in the 1992 presidential race and again in 1996—after Clinton had rammed through the North American Free Trade Agreement (NAFTA), vastly expanded the system of mass incarceration and destroyed welfare. 5. The sheepdog is a card the Democratic Party plays when there’s no White House Democrat running for re-election. The sheepdog is a presidential candidate running ostensibly to the left of the establishment Democrat to whom the billionaires will award the nomination. Sheepdogs are herders,.... charged with herding activists and voters back into the Democratic fold who might otherwise drift leftward and outside of the Democratic Party, either staying home. In 2004 he called on Ralph Nader to abandon his presidential campaign. The Democratic Party has played this "sheep dog" card at least 7-8 times in the past utilizing collaborators such as Eugene McCarthy in 1968, Jesse Jackson in 1984 and 1988, Jerry Brown in 1992, Al Sharpton in 2000, Howard Dean in 2004, Dennis Kucinich in 2008 and in 2016 was Bernie Sanders' turn. 6. Regardless of calling himself a "socialist" he labeled the late Hugo Chávez, architect of the Bolivarian Revolution in Venezuela responsible for lifting millions of lives out of poverty “a dead communist dictator.” Then he saddled up for a photo op with Evo Morales at the Vatican and also voted to extradite former Black Panther member, Assata Shakur. 7. He refers to ISIS' godfather and warmonger extraordinaire John McCain as "my friend and a very, very decent person." 8. He routinely parrots the DNC lines: "the Russians hacked our elections" despite there is no evidence of such hacking, but lowered his head and tucked tail when the DNC actually rigged the primary elections against him, proving he is more loyal to the Democratic (war) Party than to the millions of people who supported him and donated to his fraudulent campaign. 9. He expressed staunch support for the aid of violently right-wing separatist forces such as the self-styled Kosovo Liberation Army, whose members were trained as Mujahideen, during Clinton's 100-day bombing of Yugoslavia and Kosovo in 1999. He has an extensive record of supporting jihadist proxies for the overthrow of sovereign governments in Yugoslavia, Afghanistan, Libya and Syria. 10. He supported Bill Clinton's sanctions against Iraq, sanctions that prohibited medicines for infants and children...more than 500,000 innocents killed for no other reason than that they were Iraqi. 12. In the 2016 elections, he betrayed millions of people that believed in him when after making the central point of his campaign the fight against Wall Street he instructed his followers to vote for Wall Street's candidate, war criminal/corporate criminal Hillary Clinton. You cannot be committed to "fight Wall Street" and abruptly endorse the Wall Street candidate. If you were to do this with a car transmission, you'd strip your gears - this is why why it baffles me when people speak of him in tones of reverence and awe.